Kyrie Irving and the Swoosh are getting in on the Halloween spirit a bit early this season with a second black and green version of the point guard’s fourth signature shoe. While the other version of the Kyrie 4 with a similar color scheme featured dripping slime graphics from its midfoot Swoosh, this iteration opts for a more conventional aesthetic. The two colors split responsibilities on its upper, while the darker green shade opts for a luxe suede material. Overall, the shoe expresses the message of eating more vegetables based on the utensils featured on the insoles of the shoes. Other details include a paint splatter graphic on its midsole as well as a flecked set of matching laces to complete this fall-friendly kids version of the Kyrie 4. 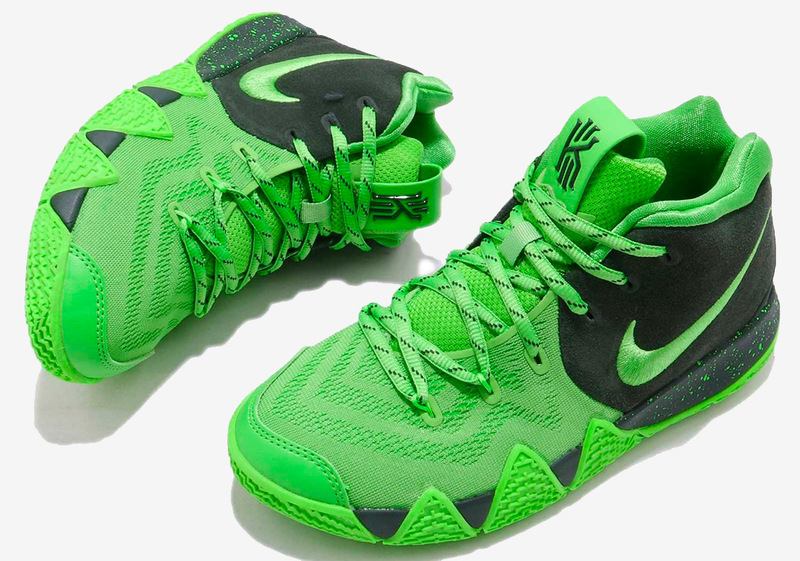 Grab a detail look at the latest Kyrie 4 style to become available and head over to eBay to grab a pair today.